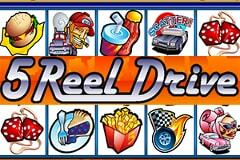 Fans of old-school pokies where basically drawn symbols are accompanied by equally basic features could try out 5 Reel Drive, from the Microgaming developer. Luckily for Microgaming and the many online casinos that carry their range, there are still plenty of people who like simple games and they don't get much simpler than this. First released in 1999, this is like an ancient artefact in the world of online pokies, but the very fact that it’s still around says something about its’ enduring appeal. Americana is the theme with this game, and boldly-coloured images of fast food, truckers, pink Cadillac’s and chequered flags are spread across 5 reels (obviously), and 9 pay lines, The pictures look nice enough against plain white reels, while a background of blended colours adds a little interest to the scene. Playing 5 Reel Drive is about as straightforward as its’ appearance suggests, as players don’t get a choice on the number of line they bet on, with the only option being how much is staked on each one. Minimum bet is a fairly steep 0.25 each line, for a 2.25 wager and the maximum is 10.00 per line which equates to a 90.00 bet each spin. So it’s not a game for the faint-hearted or anyone looking for a casual spin of the reels just to try out a game. Players need to be fairly committed especially at the higher stakes, which seems a bit dumb, as Microgaming are excluding a huge number of potential customers who could play for just 0.01 a line for example, and then move on to bigger stakes if they liked the game. Still, I don’t make the rules and plenty of people are at the 5 Reel Drive pokie wherever it’s carried. Once stakes have been made, all that remains is to click to spin the reels and wait for identical symbols to line up across the lines, staring from reel 1 on the left side. Payouts depend on what symbol appears, with the Coffee and Donut being worth 6, 13 and 50 coins for 3, 4, and 5 respectively across a line, but should 2, 3, 4 or 5 of the Chequered Flag and Burning Wheel symbol appear then wins equal 12, 40, 500 and 10,000 coins. As for bonus features, well there isn’t much to say, as there are no free spins, progressive jackpots, side games, pick-a-prize rounds or anything else really, but this game is aimed at players who just want to spin the reels and see what happens. It’s not totally devoid of action however, as the Wild and Scatter symbols add a little variety to the run of play. The Road Sign is wild, and should players get 2 of the any identical symbol plus the Wild on a line, it will count as 3 of the same and bring a reward according to the regular payout schedule. Even here, the Wild lacks any other feature, so any hopes of getting a payout multiplied when it’s completed by it, or having a big win created solely by a line of Wilds are dashed I’m afraid. Likewise, the Cop Car Scatter symbol doesn’t trigger any extra bonus rounds. It does however, pay out prizes that are multiples of the total number of credits staked per spin, and like the name suggests, it can be scattered around the reels without needing to be across a line to treat players to a win. You need to be looking for just this type of game to really appreciate 5 Reel Drive. Anyone who likes extra features will steer away from this Poker machine, but fans of the simpler pleasures in life will want to charge right in. It’s just a matter of taste. One issue I have to take with this game is the high minimum stake and I really don’t see the value in it, but apart from that, it’s very much a case of what you see is what you get, and it’s none the worse for it.